The latest edition of Why Risk Our Lives For a Thrill When We Can Watch Someone Else Do It? 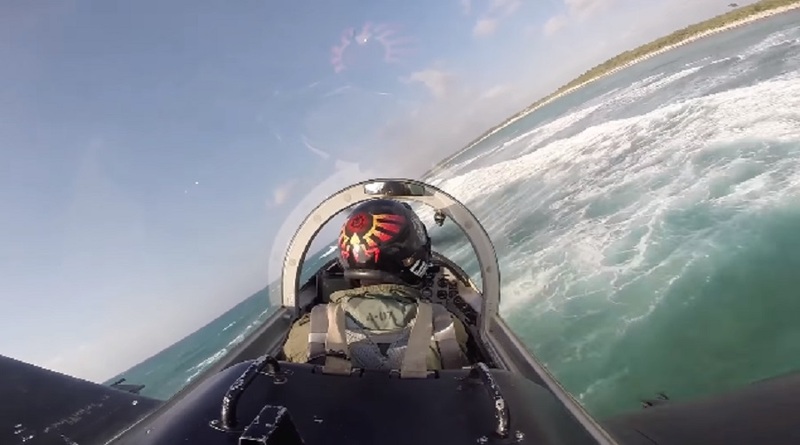 comes in the form of this cockpit footage of a pilot flying extremely low to the ground. Perhaps we’re confused, but we thought planes were designed for transporting people and objects at HIGH altitudes. We need answers ASAP because daredevil pilot’s nail-biting, low-level flight has stopped us from breathing a few times already, and our poor hearts can’t take it anymore. Apparently, this nerve-racking procedure is known as an NOE, or nap-of-the-earth, flight, a practice implemented by military to keep their planes from being detected by enemies. So, we get that. Stay low to stay safe. Makes perfect sense! But then we watched this Mexican Air Force pilot nearly graze the earth with his trainer aircraft over and over again, and logic immediately left the building with no sign of returning. Um, this isn’t a boat, but it sure looks like one. For an entire anxiety-filled two minutes, the seriously brave and exceptionally skilled pilot flies over (and we use that word loosely) a river and comes way too close to the surface of the ocean. We continued to watch because apparently, we derive inexplicable pleasure from viewing these sort of stunts, even though they leave us sweating profusely, short of breath, and grinding our teeth in extreme angst. “The lack of precision is dangerous when the margin of error is small,” a line on the screen reads. Small as in flying only a few feet off the ground in an aircraft that can reach speeds of up to 310 mph? Sounds pretty cool, but we’ll gladly leave this experience to the pros.